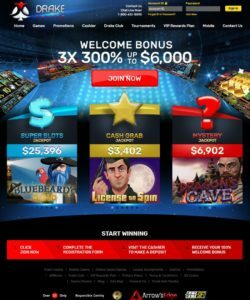 If you are above 21 years and love gambling, you might want to check out Drake casino. Since 2012, the casino has been offering great service to players that enjoy Betsoft games. The website contains a variety of services for customers. We cannot, however, overlook the red flags from this casino. That is why we put up the following review. Read on! As we mentioned, Drake casino works with the software provider Betsoft to supply it with games. It also works with Arrow’s edge software which provides creative and interactive games to players. Drake casino offers all kinds of games including 3D slot games, progressives as well as specialty games. You can play the slot games from a mobile device even though specialty games are not available in this mode. 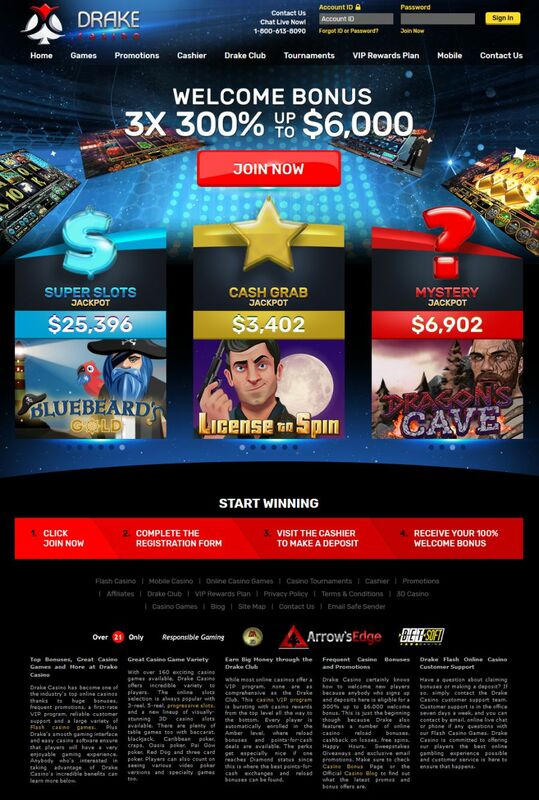 The mobile casino also provides edge jackpot progressives. Though the casino provides regular bonuses, it does not outline clear details on how to earn them. You may benefit from the cash back program or the tournaments available. The site provides buy-in tournaments which players find fun to plays and stretch their wins. One of the payment options that the casino works with is the Bitcoin. The problem with Drake casino is that it charges high fees when making withdrawals using the cryptocurrency. You can incur a fee of up to 3% on a credit card transaction. Other payment options include Visa, MasterCard, Pre-paid gift cards, Quick Cash, Skrill, and Neteller. The transactions may take between two to five working days to go through. You may get frustrated with delays if you need instant cash. Most deposit methods do not come with a charge. The casino comes with strict terms on the payment. For instance, you cannot withdraw an amount anything less than $ 100. Drake casino also provides customer support in the form of live chat. The problem with this feature is that it has limited hours and does not work around the clock. The website also provides an email address and phone lines both local and international. Since the live chat hours are limited, you can send them an email after midnight and wait for your response the following day. Some users experience delays when it comes to receiving feedback from the customer care department. It works under the laws of Curacao and has a license from Curacao e-gaming. Drake Casino has a variety of games, but it also comes with some flaws. The website leaves out crucial information such as the lack of a link to prove its licensing. It also puts a high age limit which hinders some young adults from accessing the casino. The owner should work on reducing the high fees on withdrawal transactions and include live games. The customer support should also be more efficient when it comes to delivering feedback to customers.